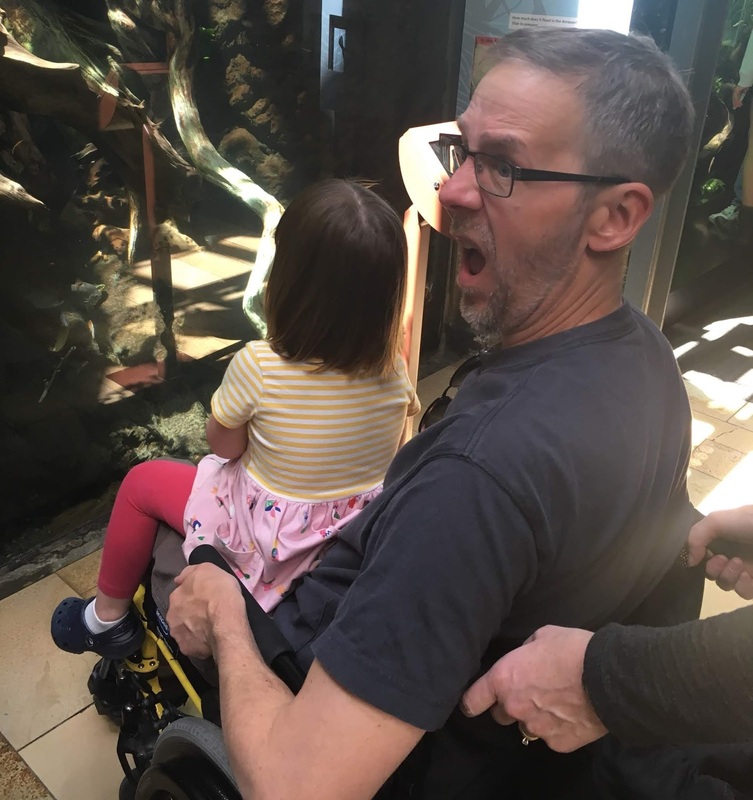 For a couple years, my wheelchair was terrifying. Not to me, mind you, I’ve always been, like, whatevs. I’ve got MS and I deal with it. But to my niece Lindsey, who is approaching four, my wheels were a cross between Alien, Pennywise (the clown from It), and that horror movie doll Chucky. A trifecta of terror that could only be made worse with Nickelback songs playing on a perpetual loop. And then Lindsey had an epiphany, as much as a three-and-a-half-year-old can have epiphanies. For her entire walking life, Lindsey demonstrated her running prowess and her hide-behind-mom’s-legs-and-moan skills whenever I appeared rolling anywhere near her. My arrival would cause that little girl to scatter like a freshly unearthed roach, which at first allowed for some peace and quiet. I was the Roomba, she was the dog—we had a mutual understanding to stay the hell away from each other. At least a generous arm’s length. And then inexplicably she dipped a toe in. She started laughing. With me. Not over the phone or on FaceTime, but on YouTube. My video “Laughing with Multiple Sclerosis” started trending in Wisconsin because she was watching it over and over. And over. With Mom vetting other videos for cursing (she knows her brother), Lindsey got to see her uncle in a totally different light, and she loved it. So when Kathryn arrived for my 50th birthday party a month later with Lindsey in eager tow, I was unexpectedly Mr. Popular. Our roles were suddenly, shockingly, reversed. I couldn’t escape her clutches as she latched onto me like refrigerator magnets on a mission. I also discovered it is beyond challenging to enjoy a beer when you have a squirmy child with all four limbs suctioned onto you all octopus like. The highlight? 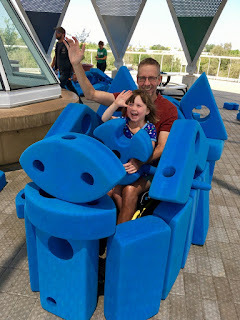 On her last day we played bus at our local children’s museum using oversized foam blocks. Lindsey tasked herself as the bus driver (notice the seatbelt, safety first!) and I was, natch, the bus. We could not have had more fun, so much so that she was crestfallen when it was time to go home. I even got smothered with hugs and kisses, completely unthinkable just weeks earlier. I can’t wait until we get to roll again together. Maybe next time I’ll play Thomas the Train! Or Lightning McQueen! I won’t miss too much the relative peacefulness and quiet of playing the bogeyman, no. But if I’m smart I’ll enjoy a quick beer before she spots me. Love this 'evolution' of your and your niece. My youngest two step-great-grandkids - two years and seven months - find my manual wheelchair an attraction. The oldest loves trying to push me around the house, or climbing on my lap, while the baby loves chewing the wheels or standing with the chair as support. Love this! I suggest you learn the Little Einstein theme song, or is she past that age? Kim and Fran, thanks! I have no clue what Lil' Einstein sings. A rapper for toddlers I'm assuming? Gotta investigate. Thanks Kathy! Yeah, kids are good at not realizing how f upped we are. Oh to be a kid again! Nick, this disease is so unpredictable. You may never need a trike, and heat might never be an issue. Being close to family is almost always a bonus, though. Well, as long as you get along! Glad you found our gang despite the diagnosis. I loved laughing with Dave and have a very similar situation here in Australia with one whose name is Elke and is also four. 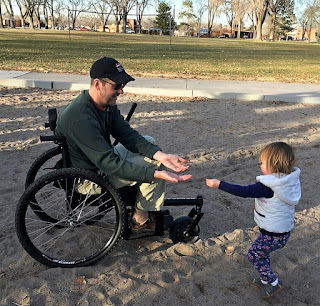 My husband was diagnosed with PPMS in 2011 and for the first few years rejected any walking aides or scooters. I bought a stroller for our little dog (because I knew it would help him to push it) and even though he adamantly had told me not to buy it, he tried it when it arrived and loved it. Eventually he needed more help and he bought a scooter that looked like a motorcycle which got us back on the trail after 3 years. Last year I bought him a modified Segway with a seat and he was back on the beach. Our nieces (the bravest ones) have always enjoyed a ride on his scooter with him. Great story. Once they get over the fear, a wheelchair can become as popular as Little Tikes' Big Red Coupe. They love to push, ride & wreck. Thanks for sharing your special memory!